Stayed for 2 nights and really enjoyed the campground. The staff was very friendly and helpful when we arrived. We had a pull through site which was large. They provide old dryer drums for your campfires at night free of charge. There is a $7.00 charge if you need the wood. Bathrooms were very nice and clean. Campground was quite at night. Only a short drive to Tombstone. WIFI is adequate. 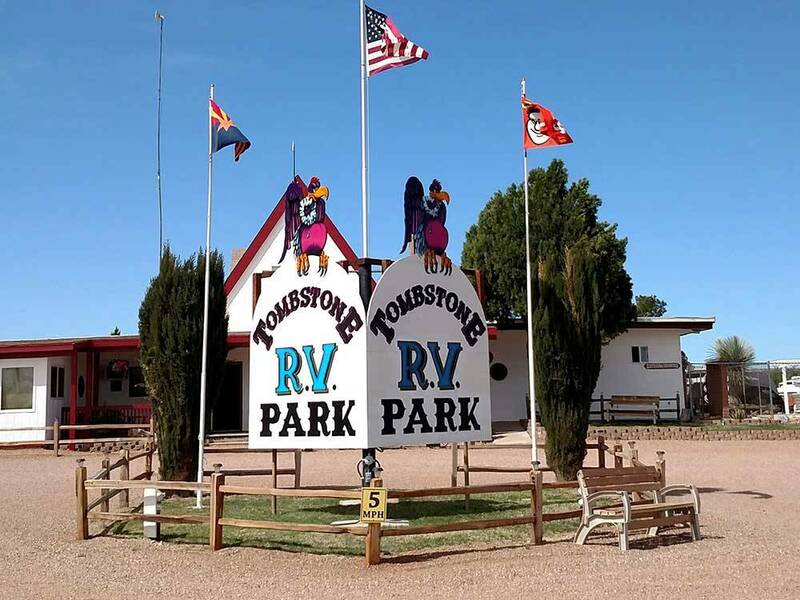 If you want to visit Tombstone don't hesitate to stay at this park. The other parks in the town of Tombstone looked cramped and not appealing. FYI, if someone tells you to take a 30 minute drive to visit the town of Brisbee don't waste your time. We did and were disappointed. We stayed here in October 2017 in a travel trailer. Lady in office very friendly and helpful. Mary the lady that escorts you to your space was extremely helpful. The owner came out to offer help so that I could keep my trailer hitched up since I was leaving the next morning. The bathrooms were clean and spacious. Everyone gets a nice picnic table and the spaces are mostly level. I will be going back soon and staying longer. Wat een fijne camping om te staan. De eigenaren zijn zeer behulpzaam. We werden zelfs met een shuttle naar Tombstone gebracht en weer opgehaald. Alles op deze camping ziet er verzorgd uit. Een bakkie koffie staat elke morgen voor je klaar in de gezellige gemeenschapsruimte. Daarnaast is een tafeltennis, lees ruimte. De camping ligt vlak aan de weg, maar daar heb je 's avonds en 's nachts geen last van. This campground is immaculate! The grounds are well kept as is the facilities and pool. We enjoyed staying here during our visit to Tombstone. It was so quiet and only a few minutes out of town. I recommend a stay here! First class all the way. The owners and park hosts were extremely friendly and helpful. 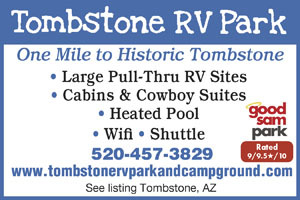 They have a shuttle service to Tombstone which was the reason we picked this RV park. Quiet setting, clean, clean, clean. Site was level, included a picnic table. Stayed two nights. We were there with a group for three nights.The owners were awesome and the showers were nice and hot.The ground was leveled with pea stone and nice drive thru spaces.They also offered free shuttle down and back from Tombstone.Hookups are easy.